If you had two thousand dollars, and you wanted to be a somewhat responsible audiophile, (is that an oxymoron?) you might want to spend said two grand on a new integrated tube amp. 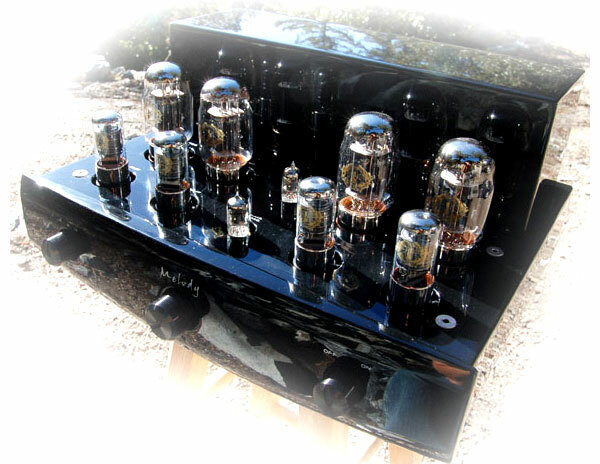 Because right now there are several really amazing integrated tube amplifiers on the market. The Melody MK88, a Class A, KT88 integrated tube amplifier with a clean and no nonsense physical appearance is one of them. Priced at $1995, youâ€™d have enough left over for a couple bottles of Two-Buck-Chuck. To sauce you up as you thoroughly enjoyed your new toy. A few months ago I picked up the very first MK88 brought into the US . The distributor had put a couple hours of break in time on it, but it was up to me to do the rest. I was excited to be the 2nd person ever in the US to hear it. My wife and I noticed while putting the amplifier in the car, that had it been shipped to our home, it would have come in a very securely packaged box. Doubled up thick cardboard boxes and thick impact foam would surely have saved the amp from any minor fender bender along its travel. It even has white cloth gloves, so you can feel like a butler as you unpack it. The gloss piano black finish does show every smudge, and smudges are very un-butler like. But I warn you now, be careful. This amplifier could be a back breaker. It weighs in at nearly 60 lbs. I had to conjure up some â€˜anything you say, sirâ€™ might to remove this beast from its cage. Once removed, all I had to do to get it going up was to take the foam off the tubes and plug it in. I must admit that my last experience with a tube amplifier (at my home anyways) was when I was packing up the soon-to-not-be-mine, Golden Tube SE-40, to ship to an AudioReview forum member in Canada. Both my wife and I hoped weâ€™d never see it. And though this isnâ€™t how all audiophiles feel about tubes, it is how a good portion of them do. But Iâ€™d hope they would at least give the MK88 a listen. Maybe there is something that offers the cleanliness of a solid state with the musicality of tubes. During the review period of all three amplifiers the source components would consist of Electrocompaniet PC-1 CDP ($2400) and the Rega P3/24 with Sumiko Evo III Blue Point Special cartridge with a Moon LP3 phono amplifier ($2500 all together). At this time I was lucky to have on hand a set of Supra Sword speaker cables (~$1000) and interconnect cables ($800). Let me quickly say I was sad to have to send these back. (Supra Cables review to come on Dagogo.com) I had in 6 different monitor speakers to pair the amplifier with during the review period but the predominate amount of time the MK88 would be paired with the PMC TB2i ($2400). Though I also hooked it up to the Brodmann FS stand mount monitors ($4995), Axiom M3v3 bookshelf speakers ($348), Ascend Acoustics Sierra-1 monitors ($800), Electrocompaniet PSB-1 monitors ($1200) and a few random others. Basically I wanted to play this amplifier on a variety of speakers to learn what could be considered to be its basic and general characteristics. I’ll be forthright in letting you all know that I’m not a super tech type of audiophile. I listen for the enjoyment of hearing great music played on a great sounding system. What Iâ€™m really after is an emotional engagement to the equipment and music. I’m not always overly concerned with the latest and greatest amplifier design, slue rates, voltage gains, diodes, and quiet frankly 100% perfect reproduction of the source material. I’m not a technophile in the audio world. But I will do my best to explain how the MK88 works. The MK88 is a KT88 tube amplifier with 32W per channelÂ operatingÂ in Class A. Â It uses point to point wiring, limiting the derogation of the sound as it passes through the amplifier. The volume control is linear. There is an easy to use remote volume control. The system on the MK88 is the same as the rest of the new Melody gear. That being a motorized discrete resistor ladder attenuator. I almost never had the amplifier turned up more than half way. It could play very loud, very quickly. But the audio signal never showed signs of breaking up at high volumes. The sound signal hits the 6Ak5 tubes, than 6SN7 and passes a auto biasing stage to the KT88 tubes and out to your speakers. Comparing the Melody to the Mystere and PrimaLuna amplifiers Iâ€™ve been able to review, the MK88 design is more along the lines of the Mystere. The Mystere is more like a Ferrari. If you donâ€™t need it to go fast it probably isnâ€™t in the car. The Melody one could argue might be like a Lamborghini. Even more exiting. Over the three months I had the MK88 in my system there were no signs of problems. I also asked the Hugh Nguyen of Angle City Audio, the US distributor for Melody, what would be the repair route if something were to go wrong. He reported that in all likely hood repairs would take place state side.